Not many can do what these Barbets can! So, you decide to see what the Barbet is, since you have never heard of the breed...So, you decide to do a search on an engine for links. You have a brilliant idea to look in different countries, to see what they look like. Then you see how many breeders there are, all over. Amazing, huh, that there are soooooooooo many breeders for such a small, rare, breed. You wonder how they do it. It does not take Einstein to draw proper conclusions. Oh yes, there are more and more births( yippetydodah), but of what??????? "Some dog experts believed that Baron von Zedlitz' had really used the Poodle in creating the Pudelpointer. 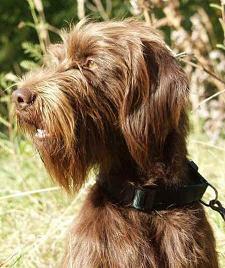 However, other experts believe that the Pudelpointer was developed from the Barbets. Incidentally, the Barbets are the ancestor of the Poodle. 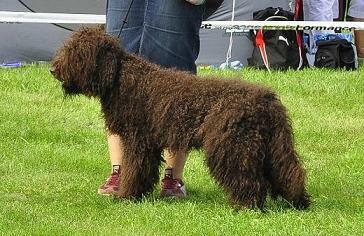 The intelligence, the attachment and the great desire to please the owner, the passion top hunt on land and on water as well as the inherent retrieving ability was inherited by the Pudelpointer from the Poodle. The excellent scenting ability, the hunting skills and the tenacity to track game are characteristics typical to a pointer". It doesn't appear that people are fighting over the Pudelpointer's origins. 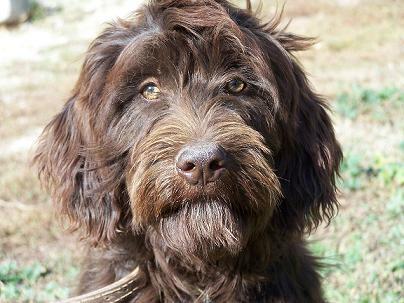 It seems to be acceptable to have different opinions...You would have to admit that the above Pudelpointer and the below Barbet look of the same family/ origins? Much more than the ones below, no? ....Some look like Grand Souffléed Bichons,Bichons descend from Barbets, but do not look like them or vice versa!Why should the Barbet look like a Bichon? "The Bichon Frise is of Mediterranean ancestry. 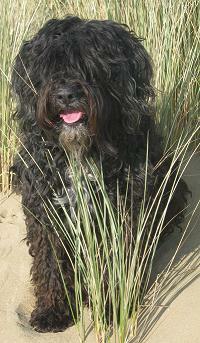 His oldest ancestor is the Barbet, or Water Spaniel, from which the name Barbichon cam, later shortened to Bichon. Also descended from the Barbet are the Caniche, or Poodle, and the Maltese. They have certain similarities because of their common ancestry, but each long ago became a separate breed." ... some like oversized standard Poodles,and don't get me wrong, I love standard poodles.Why should the Barbet look like a Poodle? ...Some are all poooooooooooooofed out as a Poodle should be. ...some like Curly Coated retrievers,I haven nothing against them. 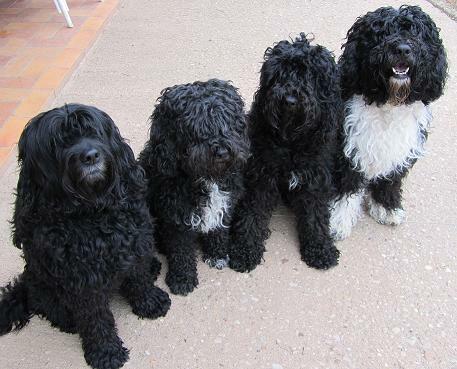 Why should the barbet look like a Curly??? Escribania de Ubrique, in some of our pedigrees. 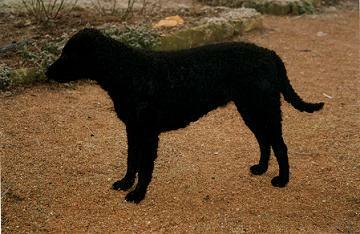 ... some like Spanish water dogs. The SWD is a short, round, short-eared dog!I have nothing against them. 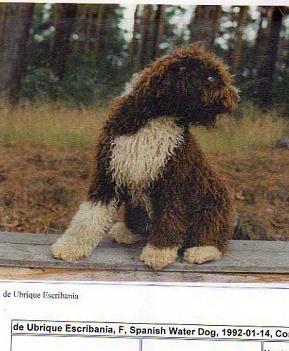 Why should a Barbet look like a tall poofed out Spanish Water Dog? ?It is a RUSTIC dog...so we know. 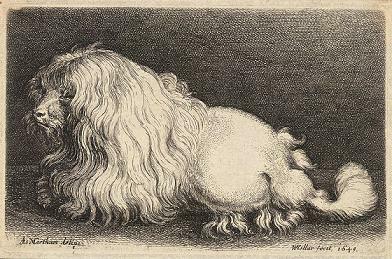 You thought you heard it was a RUSTIC dog!Well, it is and it has its own identity, not everyone else's, especially when it is in the show-ring. Put all of these in the show-ring at the same time...Which standard do you use? Then you are totally confused, so you do look for the standard. "Oh" its French....and it is a Griffon that was put into the waterdog group....so it is not a poodle, nor is it a SWD or anything else. it is a Barbet. Breeds, it is a secret to no one, have been destroyed by ir-responsibles, in-competent know-it-alls.We do have a bunch. It's like a time-bomb. It would seem that all should be concerned with what they are claiming as beeing Barbets, and perhaps take a look at the standard and reference material, before thinking they're doing something for the breed. All will meet next year at the World Dog Show. Now if there is a place you need to be, well. That's it. Bring cameras, videos...it will be memorable. Now, I say, let's make sure we use all the 1 year-old poodle types,not wait til we see how their offsprings grow and forget any Barbet blood older ones may have.You never know the world may run out of poodles. Poppenspaler's Ungersheimer had been fixed. He fit right in to line one. Dixie Chick, Ashley von der Leibrücke are very similar to Coccolina. Right now, I can't use any other examples as they have not been measured.Hopefully this will happen soon as this data is starting to speak. It would appear that Arkanne, on the coast in St Brevin would have similar "roots".